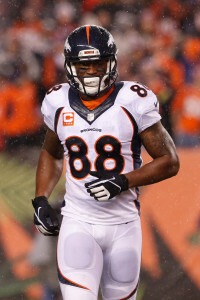 The Patriots are interested in acquiring a “bona fide, premium” receiver before Tuesday’s trade deadline, according to Jay Glazer of Fox Sports (Twitter link), and New England has at least discussed Broncos wideout Demaryius Thomas, reports Michael Girardi of NFL.com (Twitter link). New England, of course, has already made one move for a pass-catcher earlier this year, picking up Josh Gordon and a seventh-round pick from the Browns in exchange for a fifth-rounder. But adding another receiver to a depth chart that already includes Gordon, Julian Edelman, Chris Hogan, Phillip Dorsett, and Cordarrelle Patterson could prove appealing for the Patriots as they head into the second half of the season. As Girardi tweets, the Patriots aren’t necessarily focused on any one player or position as the trade deadline approaches, but Thomas is undoubtedly available for the right price. The Broncos have reportedly received interest in both Thomas and fellow wideout Emmanuel Sanders, but they’d prefer to move Thomas — and his contract — off their books. Thomas is signed through 2019, but the Patriots — or any club that acquired the veteran receiver — could cut him after 2018 with no dead money accelerating onto their cap. For the rest of the 2018 campaign, Thomas would be relatively affordable, as he’s due roughly $4.5MM over the next nine weeks. The Patriots currently have ~$5.1MM in available cap space, per Over the Cap, meaning they’d just barley be able to fit Thomas onto their books without making any other moves. Thomas, 30, has posted 33 receptions on 49 targets, managing 372 yards and three touchdowns in the process. “Barley able to fit Thomas …” ????? So do they want Demaryius Thomas or a ”bona fide, premium” receiver?